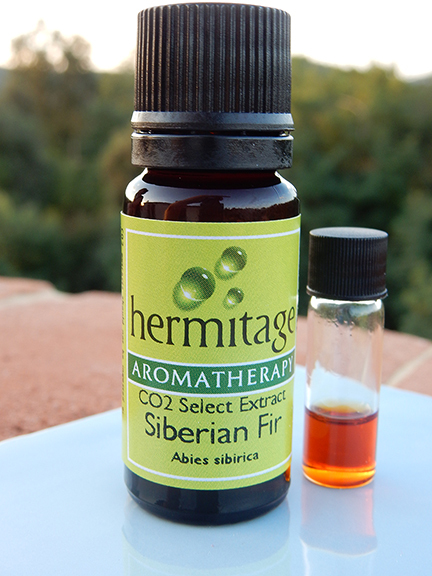 Adam Michael has this to say “Opening the cap for the first time, this Siberian Fir CO2 really managed to wow me. The scent oozes Christmas, just like smelling a real Christmas tree. At the same time I can’t help feel the scent is reminiscent to the taste of spruce candies, slightly balsamic sweet but also with a bitter needle aspect. My partner tells me this reminds her somehow of a very hot Mediterranean scrub, even though such a scent doesn’t really belong in a Mediterranean scrub! This said this Siberian Fir does produce such intense, warm, aromatically charged impressions with good persistence throughout, and that is really something considering it is chiefly a top note. Comparable also aromatically to a mix of cypress lusitanica, blue hemlock absolute and cassis absolute, with a big dosage of sugar for good measure and without any rough edges at all. A sweet wood base note. I can say with certainty that aromatically this is not like any other fir material, making all its counterparts look positively drab by comparison. Siberian Fir CO2 is a fulsome, yummy resinous, zappy masterpiece with trace notes of runner beans like those found within Aleppo pine.